The Hippocampe Marathon is an exciting wheelchair that enables a runner to take their loved one out on a run with them. 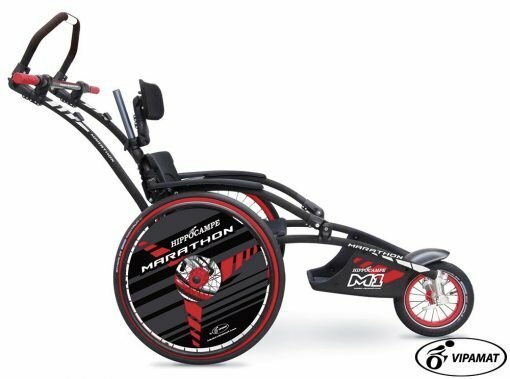 The Marathon wheelchair allows people with a disABILITY the opportunity to compete in Marathons or Triathlons, in being pushed and/or pulled by one or two helpers during the race. Whether you’re looking for a wheelchair for participating in competitive sports or for leisure activities, then look no further the Hippocampe Marathon is for you. 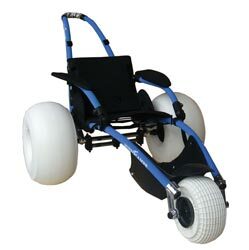 Designed, Manufactured and Developed closely with users and runners to meet their requirements as closely as possible: the thickness of the seat, and the different sizes and accessories of the frame enable different kind of disabilities to be comfortably seated during the race. The lightweight spokes on wheels to facilitate speeding on asphalt, while the design of the handlebar and the side handles optimize the push, and help for path changes. Options available: Swivel parking brakes, Waist belt, Neoprene harness 4 points, Adjustable and swiveling armrests, Multi-positions headrest, Footrest and armrests nets. – Seat Hydrophobic foam covered in comfortable black lycra of 3 cm of depth, fast-drying, and avoids skin problems. – Frame is manufactured in stainless steel and aluminium covered of a comfortable black color EVA foam even in case of long sun or cold exposure. – Push bar Anodised aluminium tube with a multi-position adjustment foam handle improving comfort and hand positioning. 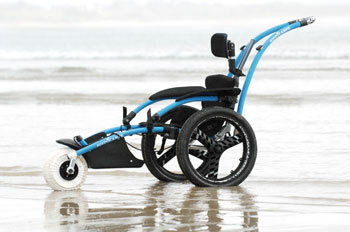 The presence of the rubber side handles allow the pusher to change their hand positions following the paths changes. – Front wheel 12” wheel spokes with a black Schwalbe Balloon Big Apple tire, a 12“ inner tube, and a bicycle hub. tubes, and 2 quick release half-axles. Hub of 12.7 mm.